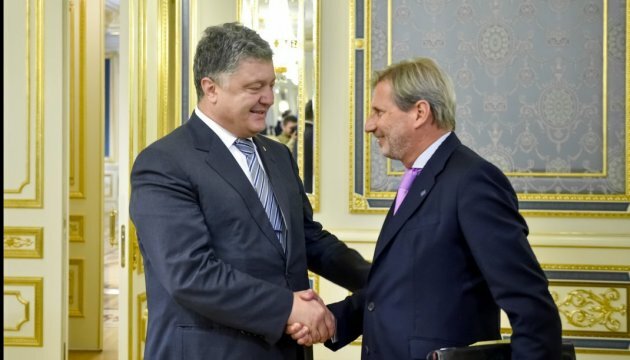 President of Ukraine Petro Poroshenko met with EU Commissioner for European Neighbourhood Policy and Enlargement Negotiations Johannes Hahn. This is reported by the press service of the Ukrainian Head of State. "The President stressed that the positive dynamics of the implementation of reforms confirmed the commitment and readiness of Ukraine to move towards change, despite the external challenges. He noted that the visa liberalization and the full effect of the Association Agreement with the EU would not only recognize the progress made by Ukraine but would also be a success story of the European Union and a response to Euroskepticism," the statement reads. In turn, EU Commissioner Hahn assured that the European Union would continue to support Ukraine on the path of implementation of the internal reforms by all possible means.